Tips to Start Organic Kitchen Garden in Your Home! These days the term ‘Organic Farming’ or ‘Organic Gardening’ or “Organic Kitchen Garden” is becoming very popular, as the homeowners strive to grow gardens that are bountiful, healthy, & ecological friendly! Organic farming is a method of sustainable farming which works in harmony with nature. It involves using techniques to achieve good crop yields without harming the natural environment or the people who live & work in it! Such kind of organic farming aims at cultivating the land & raising crops by the use of organic wastes (like vegetables, animal & farm wastes, aquatic wastes) & other biodegradable materials, that keeps the soil fertile & helps in maintaining the pollution-free environment without harming the natural balance & leading to sustainable development. Now, there are many questions which come up in your mind like…How can we actually enjoy organic kitchen garden benefits? Trapped in busy city-life & after enslaving ourselves to technology, living in multi-storey cubes with everything in a ready-to-use format, how can one practise the organic farming in the simplest way? In fact in India and many Asian countries like Pakistan, Bangladesh, Nepal, the farming itself was organic & sustainable. It is actually the western concepts that have made farming unsustainable and away from nature. The west after realised its mistake is now trying to make changes to it! Starting an organic vegetable gardening in your home is fairly a straightforward idea, which helps in preserving the original nutritional content of food, keeping us healthy & environment clean! The terrace & balcony of your house, which is used to dry clothes & to keep all the junk, can be converted into your home-made organic kitchen garden. With the reports of the existence of pesticides in vegetables, fruits & food items becoming a regular feature in magazines & newspapers, It’s time for you to turn your hands dirty & set up an organic kitchen garden in your home. With the urban space constraints, cultivating the garden for pesticide-free fruits & vegetables may seem like an incredible idea for most garden lovers residing in bigger cities & towns. But growing & owning an organic kitchen garden in your home is possible! The process is cost-effective & needs low-maintenance. The only thing is required a lot of patience & perseverance! The basic knowledge & materials required to start your own organic vegetable gardening are as follows. The experts suggest the easy steps that are given below. Select an area in or around your home that receives sunlight at least 4 to 6 hours a day. This should not be difficult even for urban dwellers. 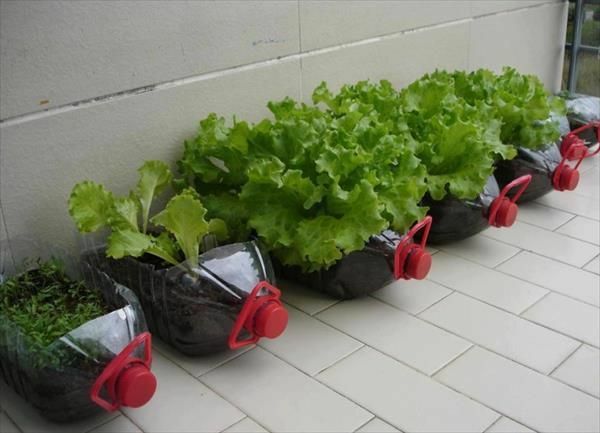 Balconies, Windowsills or open passages can be used for the organic gardening! It is not necessary to invest on fancy earthen pots for an organic kitchen garden. You can reuse or recycle your old plastic bottles, buckets & bathtubs to grow vegetables, only make sure you give proper drain to the containers. For e.g. take the medium sized tub; fill it with soil & home compost to grow cabbages, capsicums, cauliflowers, etc. The herbs you use the most will be the ones that work best in your kitchen garden. There is no use of growing herbs that you don’t use in your recipes. You can plant such herbs in a small container, ice cream cups & other such plastic containers that can be recycled & set to use! The most important step in kitchen organic gardening is to make nutrient rich soil (Amrut mitti), which has abundant & diverse microbial life that supports the healthy growth of a plant. It is simple to prepare & the results are extremely effective! You may start with whatever you have; there is no need to buy the earthworms or any other stuff. Just convert your kitchen organic waste into the resource. Keep sprinkling some red earth in the pots from time to time. Make a mixture of compost & red earth of 1:1 ratio. You may collect the top layer of soil from a park, a friend’s garden or from an open park. Must Read: 6 Steps to Make Compost From Your Kitchen Waste! You can also source the seeds from any of the nurseries from your city, Always go for open pollinated seeds, not the hybrid. You can start by growing basic vegetables like Curry leaf (kadi pata), mint leaves (pudina), basil (tulsi), chillies, lemon grass & different varieties of spinach. They are one of the simplest to grow. Since they don’t require too much of sunlight, the plant can be kept in a living room or placed near the window. Mulch is the layer of organic materials placed on the top of the soil as a protective cover. It helps to suppress the weed germination, retain moisture, insulate the soil, & reduce erosion. It is always important to mulch your soil. You have to keep it covered with a layer of dry crushed leaves or sugarcane bagasse. Sugarcane bagasse can be easily collected from sugarcane juice vendor seen in most towns & cities. They either throw away the dry sugarcane extract after extracting the juice or keep them for feeding animals. If the organic waste becomes too wet, add newspaper, dry leaves and soil to cover it. This helps in reducing the loss of water due to evaporation. It also insulates microbes & organisms in the soil from direct heat & also provides food for them! Add the dose of Amrut Jal every 15 days, after you have sown the seed. Amrut Jal is essentially a liquid solution comprising fresh cow dung, cow urine, organic black jaggery & water. If organic black jaggery is unavailable, you can replace it with six ripe bananas/jackfruits, or two glasses of plain sugarcane juice. Mix together with 10 litres of water, 1 litre of cow urine, 1 kg of fresh cow dung & 50 grams of organic black jaggery. Keep this solution for 3 days. On the fourth day, the concentrated solution is ready. Mix one part of this concentrated solution with ten parts of water & Amrut Jal is ready. Add a fistful of wood ash every 3 months to your soil. Creating your own organic gardening may cost you from zero to a maximum of Rs 100 in early stages & you can keep modifying it as per your needs. So, organic farming is not that tough as you always used to think! Try out these small steps and create your own organic kitchen garden. You should definitely experience & explore the process. Organic farming & Sustainable farming is a therapeutic, & keeps you attached to the nature & mother earth! 10+ Ways to Increase the Storage Space in Your House! Home Renovation: Important Things to Know! Next PostNext Float Glass vs Tempered Glass (Toughened Glass): Know The Difference!